Need a Crown? Call Dr. Bobby Jivnani DDS of Richardson First! It’s now possible to protect your teeth and make them look as shiny as new with restorative and cosmetic dentistry procedures. A crown is a cosmetic restoration process used to strengthen a tooth or improve its shape. It’s basically a cap that’s used to cover a tooth to restore its size, strength, and shape while also improving its appearance. Dental crowns can be made from different materials including ceramics, porcelain, resin, stainless steel, and metals including gold. Protect a tooth from breaking. It’s also helpful in preventing a cracked tooth from falling apart. 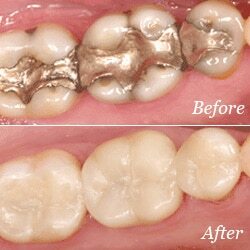 Restore a broken or worn down tooth. Cover a tooth after a filling or root canal. Improve aesthetics by covering discolored or damaged teeth. In addition to this, you will also need a dental crown if you require dental implants or dental bridges. Anyone, including children, can be a candidate for a dental crown or inlay (partial crown). The procedure is painless. Our dentist will examine your mouth and take molds to create a crown that will be ready within a week for you to wear. You may, however, be given a temporary crown until a permanent crown arrives. They come with no side effects and look just like your natural teeth. However, dental crowns may be temporary or permanent. Plus, resin crowns are usually not very durable and may break or chip easily. What is the Cost of Dental Crowns in Richardson? The cost largely depends on the material chosen. We offer affordable dental crowns in Texas. Why Should I Choose Bobby Jivnani for Dental Crowns in Texas? We are among the most well-known dental practices in Richardson. Our dentists are experienced and will answer all your queries regarding dental crowns and other dental procedures performed at D&K.